Iowa Motorcycle Accident Hip Injuries | Hupy and Abraham, S.C. The motorcycle crash may have only taken a few seconds, but the change in your life may last for a very long time if you suffered a hip injury in the crash. A hip injury can result in extreme pain. It can make it difficult or impossible to walk, and it can interfere with your work, family life, and recreational activities. Hip Dislocation. According to the National Highway Traffic Safety Administration (NHTSA), hip dislocations are the most common type of hip injury to result from motorcycle accidents. A hip dislocation occurs when the head of the femur bone falls out of the socket. The pain can be intense, walking will likely be impacted, and ligament damage may occur. Femur Fractures. Intertrochanteric femur fractures, a break in the femur neck, or a break in the femur head can result in significant pain and an inability to walk or bear weight on the leg. Bruised Hip. This is also known as a hip pointer injury. Any of the bones, tendons, cartilage, or muscles may be bruised in a motorcycle wreck. If you suffer from a bruised hip, then you may experience weakness, tenderness, and a reduced range of motion. Strained or Torn Hip Muscle. In an effort to minimize your potential physical injuries during a motorcycle crash, you may instinctively stretch your muscle to break your fall. This may result in a tear. You may experience pain, swelling, and weakness during your recovery. Hip Bursitis. After a traumatic injury, the fluid-filled sac in the hip (known as the bursa) may become inflamed. Like other types of hip injuries, bursitis can result in significant pain. Anti-inflammatory medications and physical therapy may help treat the pain. It is important to see a doctor as soon as possible for a prompt diagnosis so that you can begin a treatment plan and get on the road to recovery. Treatment for a hip injury depends on the specific injury that you suffer, but may include rest, pain medication, surgery, and physical therapy. 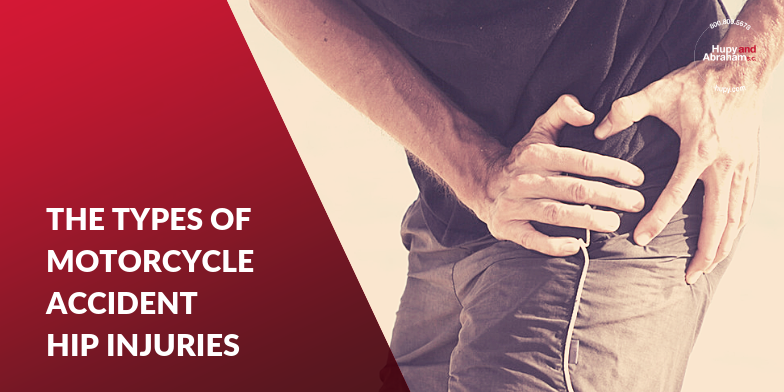 Any of the hip injuries described above can have a significant impact on your life. During your recovery period, you may be unable to work, drive, or walk without assistance. Your medical bills may pile up at a time when you are unable to work and earn an income. However, if someone else caused your motorcycle crash, then you may have the right to recover fair damages for your injuries. Economic damages. A dollar amount can be assigned to these damages by providing copies of bills or evidence of loss. Economic damages include, for example, medical costs, out-of-pocket costs, and lost income. Non-economic damages. Non-economic damages may be harder to prove than economic damages, but they are every bit as important to your recovery. Non-economic damages include things like your physical pain and emotional suffering. Your damages may add up quickly, and if you fail to take action, then you may remain solely responsible for all of the costs associated with your injuries. This can be financially devastating. In order to avoid the financial burden, and possible financial ruin, that a motorcycle accident can cause, we encourage you to contact our experienced motorcycle crash injury lawyers. Our lawyers, many of whom are also avid riders, will investigate what happened to you and work hard to get you the legal recovery that you deserve through settlement negotiations or in court. To learn more, we invite you to text, call, or reach out to us via this website at any time to schedule a free, no-obligation consultation. We would be happy to meet with you in any of our Iowa offices, Cedar Rapids, Des Moines, or Quad Cities, or at a location that is convenient for you. ?What is a fair motorcycle accident settlement? ?What should I do if an insurance adjuster asks me to give a recorded statement after a motorcycle accident? ?How do I decide which motorcycle accident lawyer to hire after an Iowa bike crash?